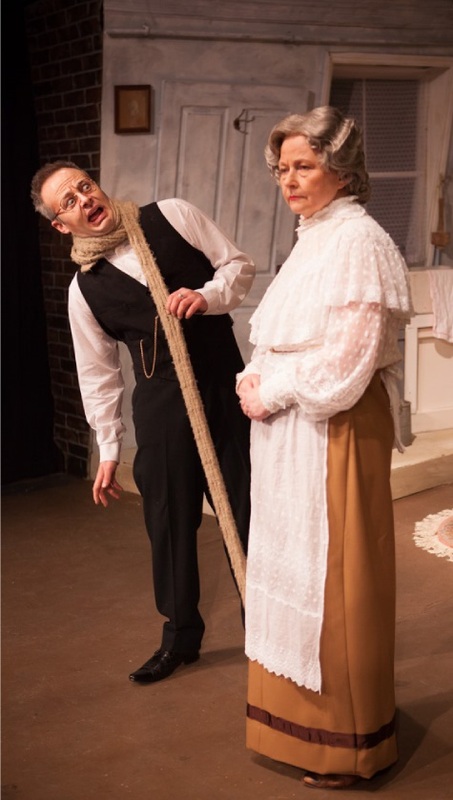 THE first hurdle for any company contemplating the stage version of this much loved Ealing comedy is the necessarily elaborate set and Hall Green have cleared that particular obstacle with ease. It is the first thing you see and designed by director Edward James Stokes it is worthy of a round of applause on its own from its wonderful front cloth to the lopsided, subsidence-plagued home of Mrs Wilberforce with her rickety stairs and conspiratorial bedroom, over the Kings Cross rail tracks. There is even an instant rooftop scene – the whole thing is a real credit to the painting and construction team. 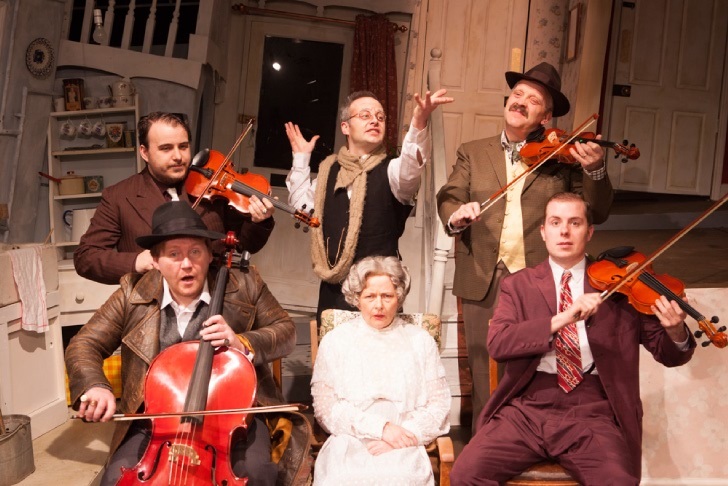 The next test is finding a cast to carry off a comedy which sported Peter Sellers, Herbert Lom, Cecil Parker and Alex Guinness in the original 1955 film, and with that particular box ticked as well, you can sit relax, sit back and enjoy yourself. The appeal of the film, and the subsequent stage play, is seeing how a sweet, slightly dotty, old widow, with a habit of caring meddling, outwits a gang of criminal masterminds, or to be more accurate, a collection of outlaw bumbling misfits. Sadly, for one so perceptive of foreign spies, interlopers and collaborators, she has no idea of the real intent of the string, or should that be ropey, quartet under her nose who are using her back bedroom for “rehearsals” for not so much a recital as a security van robbery. There is the conductor, Prof Marcus, a superb performance from Chris Butler, who can find a reason, excuse or usually downright lie to explain just about anything. He is the orchestrator of the unfolding events with his genius only held back by his choice of colleagues and a rather long scarf. Then there is Major Courtney, war hero and conman, played with a delightful hesitancy by Steve Fisher. The Major is awfully worried about the whole thing although he is assured that if he was any less involved in the robbery he “would be working for the police”. Apart from being a robber he seems almost normal until you discover his penchant for frocks and ladies clothes. Twitching away in the corner is Cockney spiv Harry Robinson, a walking chemist’s shop, in a lovely performance from Matt Ludlam. Harry carries a kaleidoscope of pills with uppers to keep him alert and twitching - and cleaning and polishing anything in sight - then he has to take downers to calm him down, then a pill to counter the downer five minutes later, then an upper, then . . . and so on. Then there is One Round, which gives us a very different Tony O’Hagan in a wonderful comedy performance as the lumbering, slow witted, punch drunk, ex-boxer who has taken too many hits and too many dives in the square ring. His mouth and brain have a very limited connection, indeed there are very limited connections within his brain itself. And finally there is the foreign, vicious mobster in the shape of dapper assassin Louis Harvey, played with a fear of old ladies by Daniel Robert Beaton. He is a dedicated pessimist with a somewhat fractured use of English who always expects everything to go wrong. As in the film he is less funny than disturbing with an implication that he is a somewhat cruel individual. There is a cameo performance by Christine Bland as Mrs Jane Tromleyton as the leading light of Louisa’s ladies’ group who arrive for a concert – using the word in its loosest sense – who gushes enthusiastically at the avant garde music. “Being fooled by art is one of the primary pleasures afforded to the middle classes,” asserts “Professor” Marcus. The ladies’ group, incidentally, like the rest of the cast were all beautifully costumed. Topping and tailing the whole episode is Pc Macdonald, played in suitably understanding and ponderous way by Andrew Cooley. Oh, and let’s not forget General Gordon, the feather-bare, diseased parrot under the cloth in the corner. Comedy depends as much on timing as script and the cast were pretty well spot on which not only wrings out maximum laughs but also builds a good, natural pace which jollies everything along – no one was looking furtively at watches in this one. The film had a dark side to the comedy with a genuine menace as the gang decide who is going to dispense with their landlady after she decides to shop them. This is missing in the much lighter passage in the stage adaptation by comedy writer Graham Linehan, who brought us Father Ted, but that is hardly an issue as the script provides an injection of witty lines and sight gags to provide a steady stream of laughs. Director Stokes keeps up a good pace with plenty of physical gags and a couple of running gags which are never over egged; and full marks too to the technical crew with lighting used to break up the set into different scenes as well as the sound and smoke as Kings Cross trains clatter past outside the bedroom window, shaking the walls and taking out the lights. There are a lot of cues to cope with and if any were missed they were not spotted. The result, a clever set, slick technical, attention to detail and superb acting, is a wonderful evening’s entertainment that would not look out of place on the professional stage. To 28-03-15.